Where the figures get really interesting is in the number of ebooks sold. Almost every Aussie also bought an ebook each last year: 22.4 million sold, or the equivalent of 28% of total book sales. Ebook sales for New Zealand are harder to measure because we have no country-specific Amazon store so most of our purchases go through either amazon.com (the US) or amazon.com.au (Australia). Still, even without figures from Amazon, Apple and Kobo sold 1.3 million ebooks here in 2016 — which makes up around 20% of total book sales. 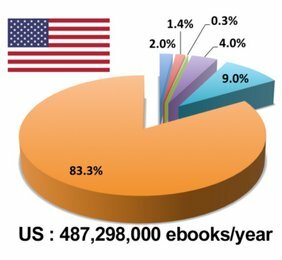 Given Amazon’s market penetration overseas, I suspect the real number of ebooks sold here is at least double that figure. The figures above come from yet another brilliant Author Earnings survey, this time of the top five English-language countries the US, UK, Canada, Australia, and New Zealand. A detailed breakdown of precisely who those “small or medium publishers” really are is promised in a future report.